Landmannahellir has for many years been one of the main dwelling place for sheep gatherers when they round up the sheep each autumn that have been grassing in this area during the summer. Landmannahellir is described such in the book Sunnlenskar byggðir V (Rangárþing II), page 142.
" When the sheep gatherers round up their sheep they have their main centre at Landmannahellir, south of mount Hellisfjall. Earlier the cave itself, that is today neither big nor magnificent, used as a stable for the horses, and it was estimated that 70 horses could stay there, up to 80 horses if they squeezed in. 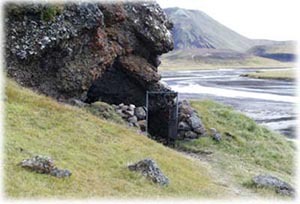 Sometimes people slept in a small side cave, and once a small cottage was in front of the cave. In 1907 a cottage was built close to the cave and rebuilt later". At the east side of the cave are the ruins of walls, used to keep the sheep on one place. The cave is not big today and it most likely that it has gradually shrunk somehow or perhaps the cave was bigger earlier in the people's minds. The cave is in fact not more than a small cave today. Now sheep gatherers use the good facilities at Landmannahellir still as one of their main dwelling place when they round up sheep in autumn and they stay there for two nights. The old hut for sheep gatherers was built 1907.